Although the aquamarine derives its name from the Latin phrase ‘aqua marina,’ its distinctive blue shades can be attributed to traces of iron found in the layers of the earth that are present at the time that the gemstone is created. Being a variety of the Beryl family, it is found in large clean crystals which makes it the perfect stone for a statement ring, if you are looking for something big and beautiful. Aquamarines and blue toned gems have recently seen resurgence in popularity thanks to Meghan Markle, the Duchess of Sussex wearing Princess Diana’s Asprey Aquamarine Ring at her wedding reception. Further to this, the rediscovered trend of the aquamarine can further be credited to the incredible natural beauty of the gemstone that has the ability to evoke a sense of long summer days spent relaxing by the ocean, as it resembles crystal clear waters. At their best, aquamarines have exceptional clarity and sparkle, and are readily available in large sizes. The most desirable and valuable shade of aquamarine is a deeply saturated blue, which was originally found in the Santa Maria mining precinct in Brazil, which has now been exhausted. The most valuable specimens can now be found in other areas of Brazil, with more recent discoveries of intensely saturated colours in Mozambique, Nigeria and Eastern Zambia, where it is found alongside Emeralds; the green variety of Beryl. Skilled jewellery designers can facet any shape imaginable with aquamarines. The most common cuts are traditional shapes such as round, pear, oval and cushion, however it can lend itself to an assortment of shapes and cuts, giving customers great freedom in their design and artistic expression. The wide array of shades makes the aquamarine a versatile gemstone that complements almost any skin or eye colour. Due to its extreme hardness, aquamarines are incredibly durable, don’t require any particular special care and can be utilised in almost all designs of jewellery, from statement earrings and pendants to decadent dress rings. Our Art Deco Emerald Cut Aquamarine and Diamond Dress Ring is a flawless introduction to this sensational gemstone, boasting a magnificent 5.54ct Emerald Cut Aquamarine at it’s centre. 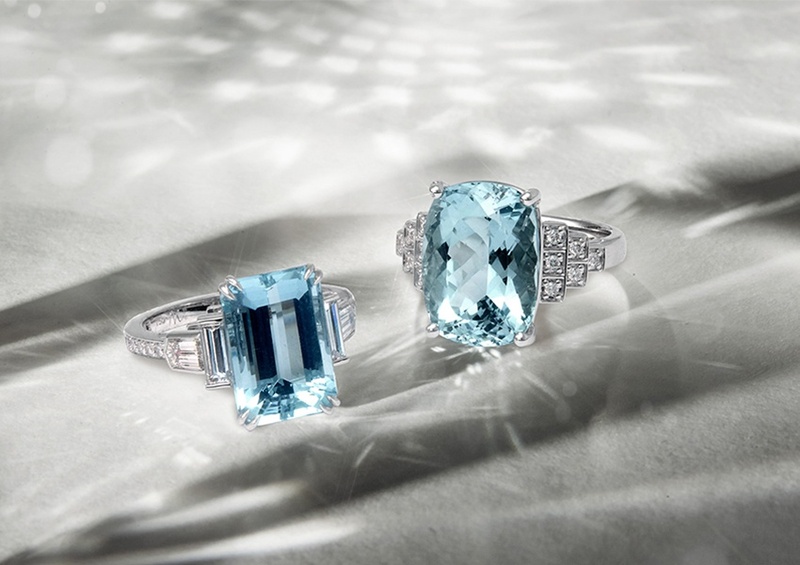 With the warmer months upon us, the aquamarine is an ideal way to add a touch of colour to your look this summer. Follow us on Facebook for inspiration on how to style your blue-toned jewellery.